According to the World Health Organization, edentulism has an important adverse impact on the individual and, in some cultures, on the community, as well (World Health Organization, 2000). Complete dentures have been playing the important role of oral rehabilitation of these compromised groups of patients but they have their own limitations. Patients usually get easily adapted to the maxillary denture, but the mandibular denture has its own share of problems to cope up with. Some of these could be attributed to resorption of the bone, as well as the movement of the tongue, cheek, and lips leading to instability of the denture. Even the denture-wearers who can wear an upper denture without problems often have difficulties eating with the lower denture. If implant retained overdentures are the treatment of choice, then one major requirement will be the available bone at the edentulous site which is often limited due to bone loss during extraction or resorption over time. Some residual ridges are very thin and will not accept a standard diameter (3.75-4.1 mm) implant without site development. Often, grafting procedures can be accomplished if the patient desires this form of treatment. If bone grafting is planned for implant placement, then there is some debate as to the true supportive quality of grafted bone. In such compromised situations, narrow diameter implants can be used instead of regular diameter implants and additional cost and surgical intervention can be avoided. There is small diameter implants available in a range from 3.0 to 3.3 mm. Furthermore, available are very small or "mini" 1.8 to 2.5 mm diameter implants. These mini implants can provide a solution in challenging edentulous clinical situations having limited bone volume. The added advantage of immediate loading of the mini implants, reduced cost factor, reduced overall treatment time; avoidance of repeated surgical procedures and associated complications also makes it a treatment of choice for the elderly edentulous patients. This case series describes rehabilitation of three patients with mini implant retained overdentures in the mandibular arch to solve the problems of reduced retention and stability. The mini implants were used only for the lower arch, first, because the retention is usually not that big a problem for maxillary arch as it is for the mandibular arch. Second, the survival rates and health status are better for mini implant retained overdentures applied in the mandible than for those applied in the maxilla. The significance of this case series is that both the unsplinted ball and splinted bar type attachments have been used depending upon the clinical condition, and all the reported cases have a minimum 3 years follow-up period. Though preference was given to the splinted bar attachment, but ball attachments were chosen when available vertical space was an issue. A 61-year-old edentulous woman, wearing complete dentures for last 13 years, presented with a complaint of the looseness of a lower denture. On examination, the mandibular residual ridge was found to be highly resorbed. The residual alveolar ridge had adequate height, but the width was < 5 mm. Standard diameter implants would not fit in the space available without ridge augmentation procedure. Mini-implant retained overdenture with unsplinted implants having individual ball attachments was planned to augment the retention of a lower denture. Ball attachment was selected instead of bar and clip attachment due to the limitation of vertical space. 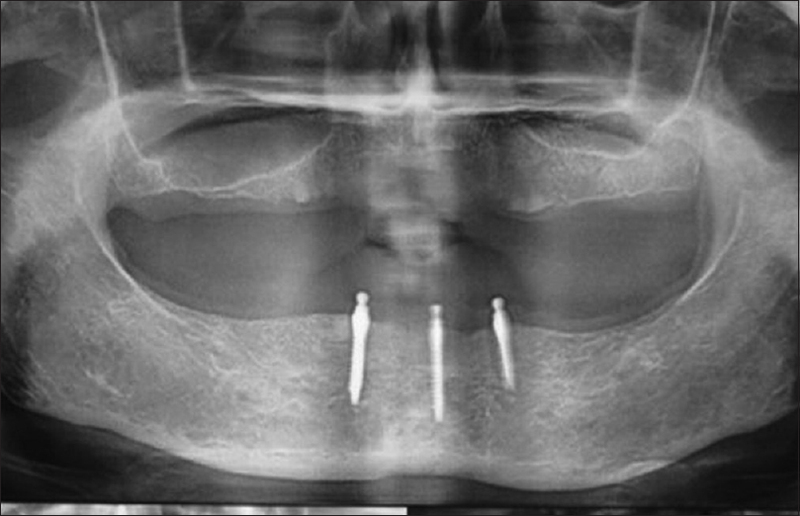 The placement of 2.5 mm diameter implants in A, C, and E positions were planned. The surgery was carried out under infiltration anesthesia, and a full thickness flap was raised using a mid-crestal incision. Duplicated denture was modified and used as a positional guide for implant insertion. Osteotomy site preparation was done using just the lance drill and 1.8 mm diameter pilot drill. Rotary insertion of the two mini implants of dimension 2.5 mm × 13 mm at A and C position and 2.5 mm × 10 mm at C position was done. (MS implant denture, Osstem, South Korea, Lot: FMN11C002, FMN11C004) were done using torque controlled ratchet device till a torque of 40 Ncm was reached. The flap was sutured using 3-0 silk sutures [Figure 1]a and b. The patient was instructed in after-care and advised not to use the lower denture till the soft-tissue healing was complete. After 1-week, the lower denture was generously relieved to seat over the ball abutments and lined with soft-tissue conditioner (Viscogel, Dentsply, Germany). The patient was instructed well about the usage and maintenance of the denture in the healing phase. An integration phase of 14 weeks was observed, whereupon patient returned for the incorporation of the retentive components. Radiographic examination was done to assess the status of implants [Figure 2] and it was found to be satisfactory as no thread loss was observed. Tissue conditioner was removed from the denture. Nylon O-rings and metal housings were picked up in the denture in a chair side procedure using self-cure acrylic resin [Figure 3]a and b. The patient has successfully functioned with the prosthesis with no complications for 3 ½ years. A 47-year-old completely edentulous woman presented with highly resorbed mandibular ridge leading to compromised retention of the lower denture. The width of the bone was inadequate in the interforaminal region. With the patient's consent, mini implant retained over denture with bar and clip attachment was planned. Bar and clip attachment was preferred as it allows rigid splinting of the implants and the available vertical space to accommodate it was found to be satisfactory. Three mini implants (MS implant narrow ridge, Osstem, South Korea, Lot: FMN11C009) of crown and bridge type having dimensions of 2.5 × 13 were placed in B, C, and D positions in the interforaminal region after raising full thickness flap. Nonresorbable silk suture was used for flap approximation, and simple interrupted sutures were given. On the day of the surgery itself, the implants were prepared to reduce the height of the abutments to around 3 mm in height and an impression was made in a stock tray using irreversible hydrocolloid material for fabrication of primary cast. The mandibular denture was relieved on the intaglio surface and was relined with tissue conditioner (Viscogel, Dentsply, Germany). Patient was recalled after one week for suture removal. Also in this visit, a final impression of the prepared abutments was made using custom tray that was fabricated over the primary cast. The impression was made using polyether impression material (Impregum™ Polyether MB, 3M ESPE, US) for fabrication of cementable bar. The bar was fabricated over the implant abutments using castable Hader bar plastic pattern (Rhein 83, Item code-022OBB). Two weeks postsurgery, implants were splinted with cementable Hader bar [Figure 4] and [Figure 5].The bar was luted in place using self-adhesive resin cement (RelyX™ U200, 3M ESPE). The denture was cleaned of previously loaded tissue conditioner material, and additional space was created for the bar and it was again relined with tissue conditioner. The patient was kept on a regular follow-up and after 15 weeks of healing phase, the clip was incorporated in the denture over the cemented Hader bar using self-cure acrylic resin through a chairside reline procedure. The positions of implants lead to fabrication of nonlinear bar. Only one clip was used as the use of multiple clips would reduce the prosthetic mobility considerably on such nonlinear bar. Patient has been using the prosthesis satisfactorily since last 3 years. Another 53-year-old female patient was rehabilitated using mini implant retained mandibular overdenture. Two mini implants of dimensions 2.5 mm length and 13 mm length (MS implant denture, Osstem, South Korea, Lot: FMN10J009) with ball attachments were used and they were placed in B and D region [Figure 6]. The implants were immediately loaded as done in previous cases. After 3 months of healing phase, denture was prepared to receive the nylon O-rings and metal housing. There is associated 3-year follow-up of uneventful usage of the overdenture by the patient. Though dentistry has evolved a lot in last few decades, but the problem of retention associated with the conventional complete denture given in compromised residual ridges still persists. Dental implant retained overdentures have proven to be a satisfactory treatment option to enhance the retention of dentures, but there are obvious limitations associated with this therapy. Conventionally used regular diameter implants cannot be used if the bone volume is not sufficient, or bone augmentation can either not be performed or has failed. In such cases very small diameter mini implants can be used to retain overdentures. Also because of the smaller surface area of the implant body, metal fatigue leading to implant fracture can happen if insertion torque is too high. To avoid complications related to implant overloading, fatigue and fracture, multiple mini implants should be used and they should be splinted if possible. Hence, they are ideally not suited for patients with bruxism and parafunctional activity due to high uncontrolled forces seen in them. In this case series, we have described a case wherein the mini implants have been splinted using a Hader bar to retain the mandibular overdenture and also the follow-up period of discussed cases is more than 3 years. Two of the discussed cases have been rehabilitated with three mini implants each and one with two implants for retaining the mandibular complete denture. Though splinting of mini implants is recommended but due to limitation of the available prosthetic space, nonsplinted ball abutment retained overdenture was given in two of the cases. In the second case, splinting of the mini implants was performed using bar and clip attachment. As these implants are available in one piece system, so crown and bridge type implant was chosen, and its abutment was prepared to receive a casted cemented bar. 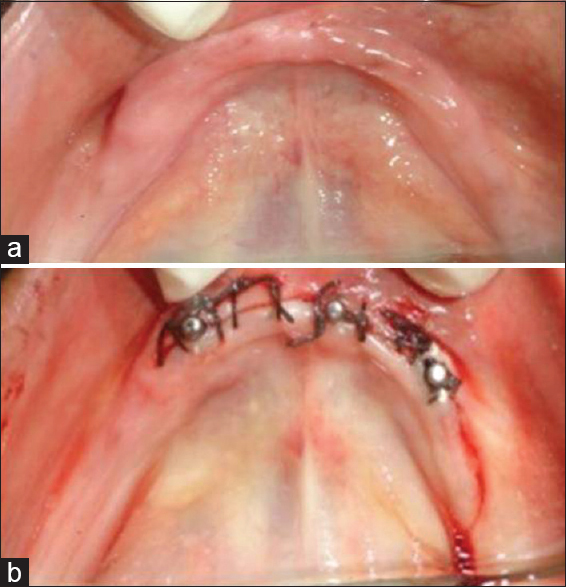 Also only one clip was used to retain the denture because incorporation of two clips on a nonlinear bar splinting three implants would reduce the prosthetic mobility considerably. In all the cases, the patient response was very satisfactory and there was no complication reported over an average follow-up period of 3 years. Multiple mini implants either used individually or in splinted form offers improved retention and function of the complete dentures, especially the lower denture. Because the surgical placement of mini implants is much less traumatic as compared to standard sized implants, they may be useful for medically compromised or elderly patients. Also the financial constraints might not allow the patient to undergo the conventional implant treatment procedure. In such cases, mini implants can be used for augmenting the retention of the dentures and improving the quality of life of patients. Though the surface area is smaller for these implants, maintenance of marginal bone level around them has been found to be better and their survival rate has been found to be similar to that of the regular diameter implants. Thus, it is our role to promote the development and testing of low cost, minimally invasive implant therapies. Though the follow-up associated with the discussed cases is relatively short, but the satisfactory outcome should encourage their further study and usage. In selected edentulous complete denture wearers having poor bone volume, multiple very small diameter, or mini, implants may be used to retain the dentures. This therapy increases the comfort and satisfaction of the patients with minimal investment in terms of time as well as money. Stellingsma K, Bouma J, Stegenga B, Meijer HJ, Raghoebar GM. Satisfaction and psychosocial aspects of patients with an extremely resorbed mandible treated with implant-retained overdentures. A prospective, comparative study. Clin Oral Implants Res 2003;14:166-72. Feine JS, Carlsson GE, Awad MA, Chehade A, Duncan WJ, Gizani S, et al. The McGill consensus statement on overdentures. 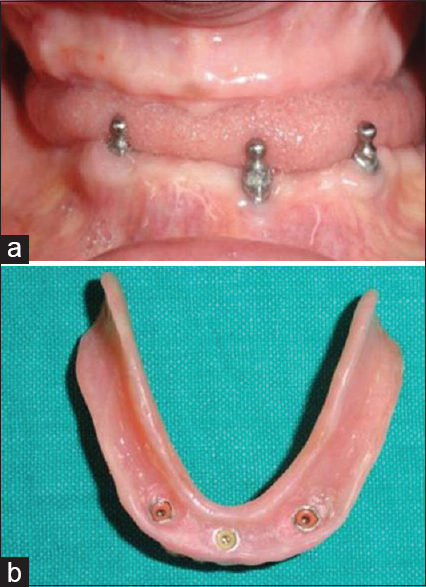 Mandibular two-implant overdentures as first choice standard of care for edentulous patients. Montreal, Quebec, May 24-25, 2002. Int J Oral Maxillofac Implants 2002;17:601-2. Takagaki K, Gonda T, Maeda Y. Lateral forces exerted through ball or bar attachments in relation to the inclination of mini-implant underneath overdentures: In vitro study. Clin Oral Implants Res 2015;26:1060-3. Jofre J, Cendoya P, Munoz P. Effect of splinting mini-implants on marginal bone loss: A biomechanical model and clinical randomized study with mandibular overdentures. 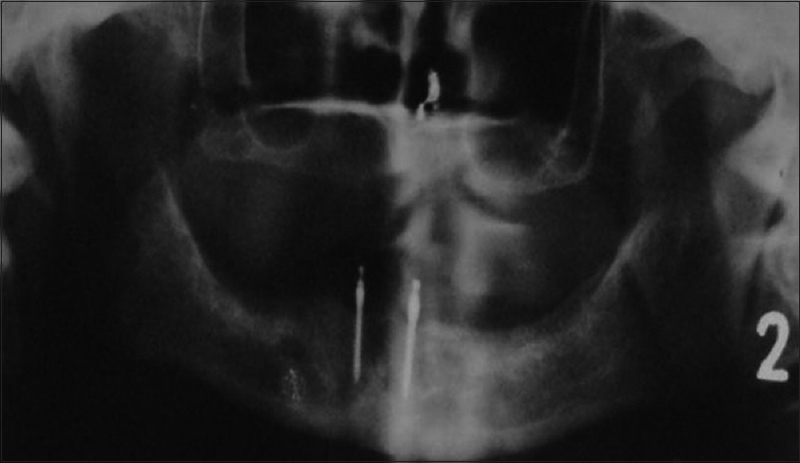 Int J Oral Maxillofac Implants 2010;25:1137-44. Preoteasa E, Imre M, Preoteasa CT. A 3-year follow-up study of overdentures retained by mini-dental implants. 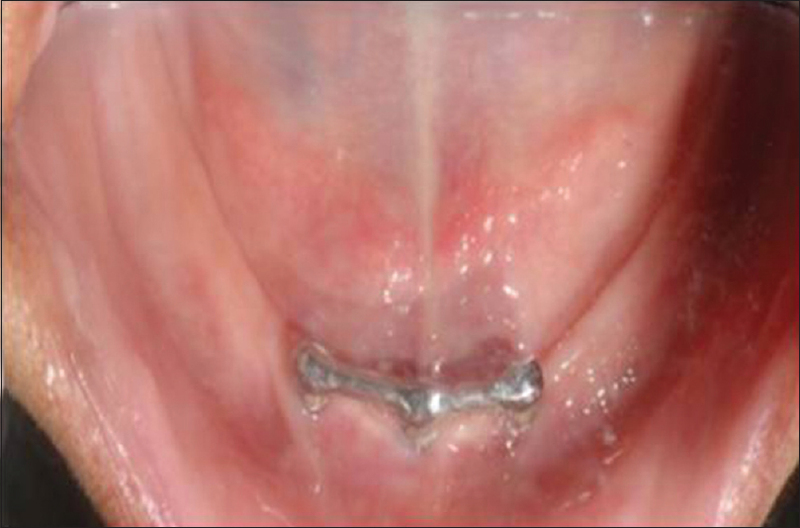 Int J Oral Maxillofac Implants 2014;29:1170-6. Flanagan D. Fixed partial dentures and crowns supported by very small diameter dental implants in compromised sites. Implant Dent 2008;17:182-91. Tarnow D, Elian N, Fletcher P, Froum S, Magner A, Cho SC, et al. Vertical distance from the crest of bone to the height of the interproximal papilla between adjacent implants. J Periodontol 2003;74:1785-8. Roberts WE, Garetto LP, DeCastro RA. Remodeling of devitalized bone threatens periosteal margin integrity of endosseous titanium implants with threaded or smooth surfaces: Indications for provisional loading and axially directed occlusion. J Indiana Dent Assoc 1989;68:19-24. Misch CE. Density of bone: Effect on treatment plans, surgical approach, healing, and progressive boen loading. Int J Oral Implantol 1990;6:23-31. Sohrabi K, Mushantat A, Esfandiari S, Feine J. How successful are small-diameter implants? A literature review. Clin Oral Implants Res 2012;23:515-25. Scepanovic M, Calvo-Guirado JL, Markovic A, Delgardo-Ruiz R, Todorovic A, Milicic B, et al. A 1-year prospective cohort study on mandibular overdentures retained by mini dental implants. Eur J Oral Implantol 2012;5:367-79.